It has proved possible for the first time to generate ultracold neutrons at the TRIGAresearch reactor at Johannes Gutenberg University Mainz (JGU). The experiment has attracted worldwide attention and the researchers from Mainz and Munich involved in the project are now in first place in the race to achieve the large-scale generation of ultracold neutrons. This is the first time ever that ultracold neutrons have been produced in a pulsed reactor. This success means that the preconditions are now in place for detailed investigation of the particles - research that may provide insight into the origins of matter and antimatter. "It took us a year, but at last we've managed it," says Professor Dr. Jens Kratz of the Institute of Nuclear Chemistry at JGU after the successful experiment on 11 January 2006, in which ultracold neutrons were generated for the first time ever. "This makes us the front-runner and all at once opens up totally new research opportunities," Professor Dr. Werner Heil of JGU's Institute of Physics comments on the event that has already attracted the attention of scientists throughout the world. The work of the researchers from Mainz on the generation of ultracold neutrons was conducted in close cooperation with the Physics Department E18 of Munich Technical University. Neutrons are elementary particles that usually occur bound in the nuclei of atoms. Externally, they are neutral, but it is possible that they may have an asymmetrically distributed charge internally that creates an electrical dipole. 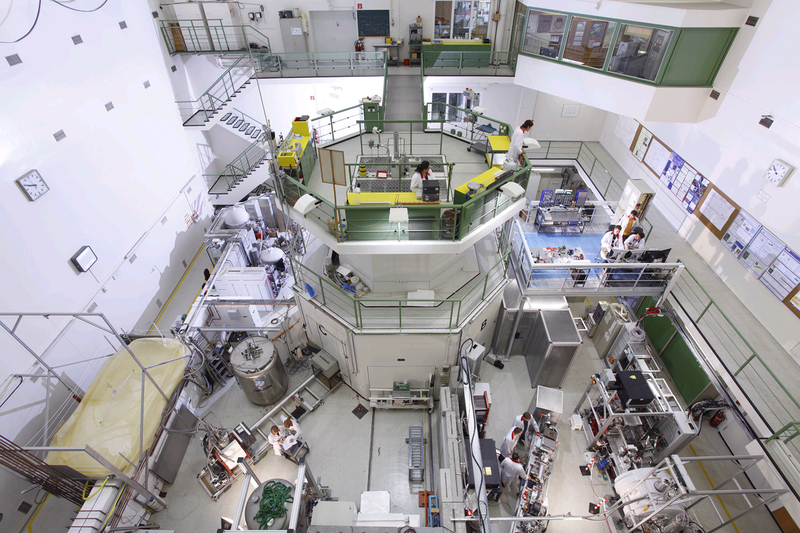 One source of free neutrons for research purposes are nuclear reactors, such as the TRIGA research reactor in Mainz. Solid deuterium that has been reduced to a temperature of -265 degrees Celsius with the aid of liquid helium is used to slow down the velocity of the neutrons generated in the reactor. This results in ultracold particles that have been decelerated sufficiently to make it possible to capture and observe them. "The problem is the cooling, because the reactor generates heat while operating," explains Heil. "However, the advantage of the TRIGA reactor is that it generates less heat than other reactors do." The TRIGA research reactor was originally commissioned at Mainz University some 40 years ago. It is a pure source of neutrons and not suitable for generating electricity as it produces only little power during continuous operation. However, the reactor can be pulsed so that it has a massive 250,000 kilowatt output over short periods, and this can be used for various research purposes. The fuel elements in TRIGA reactors consist of zirconium, uranium, and hydrogen in the form of an alloy, whereby the hydrogen acts as a moderator that slows down the fast neutrons. In pulsing mode, the temperature increases to over 300 degrees Celsius, and the moderator can no longer slow down the neutrons to thermal energy levels, so that the reactor automatically switches off. "At TRIGA in Mainz, we can produce a very high neutron flow for a few milliseconds without generating much heat," states Kratz with regard to the advantage of this nuclear reactor. The thermal neutrons generated are additionally slowed down from a velocity of 2,000 m/s to 5 m/s at temperatures close to absolute zero in the converter made of solid deuterium. In fact, research institutions in other countries already have produced ultracold neutrons, but only in small quantities - a problem that has defied solution for more than 10 years now. The Laue Langevin Institute (ILL) in Grenoble uses a conventional reactor in continuous operation and has achieved a yield of 30 ultracold neutrons per cubic centimeter. It is hoped that the experiment in Mainz will be able to generate up to 1,000 ultracold neutrons per cubic centimeter. "As a result, there are now quite new perspectives for further research," says Heil. Internationally, work on ultracold neutrons is also being conducted at the Paul Scherrer Institute in Switzerland, in Los Alamos, and at a Japanese institute. The method used in Los Alamos is different and has already achieved good results, too. "We are very optimistic that it will be possible to increase our yield by a factor of 10 compared with the 40,000 events per pulse that we have already achieved with TRIGA in Mainz," claims Dr. Norbert Trautmann of the JGU Institute of Nuclear Chemistry. Following their successful generation, the ultracold neutrons must be stored in containers so that they remain available over longer observation periods. Scientists at Munich Technical University will try to measure the life span of neutrons as accurately as possible - their half-life is about 10 minutes. The team in Mainz, however, is mainly interested in the properties of the neutrons in an electrical field, i.e. their electrical dipole moment. And this could well provide information on the origins of matter and antimatter. It has been difficult to date to undertake such measurements because ultracold neutrons were not sufficiently available. "In our universe, all that we can see is matter, while antimatter seems to be more or less absent. Understanding the electrical dipole moment of the neutron might help us explain this," says Heil.